Paramus, New Jersey’s best board certified dermatologists can help you with your skin pigmentation problem. What Is Hyperpigmentation and Melasma? Hyperpigmentation and melasma are common skin conditions which generally affect the face. While hyperpigmentation and melasma are similar dermatological skin conditions, as they cause an increase in the pigmentation of the skin, there are some differences. Hyperpigmentation typically appears as dark spots on the any area of the skin. Melasma appears as brown or grayish-brown marks only on the face. Melasma is more prevalent in women than in men. Both of these conditions result from melanin pigment found in the skin. While melasma can occur in all skin types, it is most common in women with darker skin. Melasma is commonly known as the “mask of pregnancy.” Women between the ages of 21 and 40 years are often afflicted with the dark spots appearing on the chin, cheeks, forehead, and nose. Hyperpigmentation and melasma can be effectively treated by BAXT CosMedical®’s board certified dermatologists, Dr. Rebecca Baxt and Dr. Saida Baxt. What Causes Hyperpigmentation And Melasma? Hyperpigmentation of the face is one of the most common skin conditions treated by dermatologists. The good news is that hyperpigmentation can be treated to restore your facial skin to a more healthy, renewed, and vibrant state. How Is Hyperpigmentation and Melasma Treated At BAXT CosMedical®? What Results Can You Expect? Chemical peels may be prescribed to treat spots. BAXT CosMedical® offers the latest Fraxel® system the Dual Laser which provides treatment of pigmentation problems (sun damage, age spots, freckling) and for melasma. Intense Pulsed Light (IPL) skin treatment is helpful in reviving the skin to a more youthful appearance. IPL technology is effective in removing age related spots such as freckles from the sun, reduces signs of sun damage and pigmented skin. 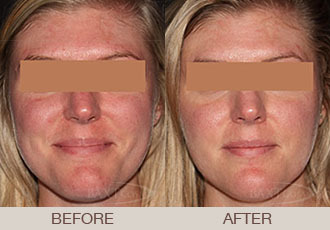 The pulsed dye laser reduces skin pigmentation problems such as skin redness and treats melasma. The V Beam Perfecta works great to treat individual sun damage brown spots. This type of laser is gentle and refreshes your skin by replacing damaged hyperpigmented skin with healthy, younger-looking skin tissue. Our board certified dermatologists will create a treatment program that works for you and your specific skin pigmentation problem. Call 201-265-1300 or contact us online to schedule a personalized appointment to discuss your specific skin rejuvenation goals. Please contact us via email for a prompt response from our office. Call us for an appointment today at (201) 265-1300. You can see our great before and after photo gallery here.